When many think of the animals that would have graced the western landscape during the Rocky Mountain fur trade era (1820-1840), they may assume that the animals encountered by trappers and traders in Wyoming were pretty much the same as we have today. However not all iconic “western” animals were present during the time of the mountain man. That leads to the question: Were there moose in and around the area that would become the state of Wyoming? Surprisingly, moose were not as common as they are today in the American West, especially Wyoming. 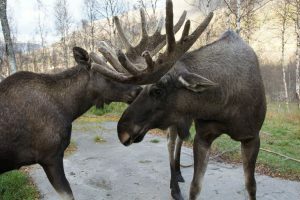 While moose in the 21st century are some of the most favorite and popular of the western animals, their presence in Wyoming has not been found in the historical accounts and narratives from the early to mid- 1800s. Many of the fur trader’s journals or letters made references to the ecology of the Wyoming mountains, but none of them mentioned seeing moose. Although a fictitious work, Edward Warren no doubt described in detail many of the things William Drummond Stewart saw on his trip to and through the American West. For him to make mention that the moose was an exception to the animals found in Wyoming is as thought-provoking as it is noteworthy. “On the fourth we passed into the Deer‑house plains, and saw the trail, and several encampments, of the Rocky Mountain Fur Co.; but no game, save one antelope. “Sometimes moose” They were indeed scarce at the time, even when sighted. The number of moose must have grown, although not by much, in Wyoming between the time of the fur trade and 1882 to be put on the list of animals hunted. Today, moose are prominent in Wyoming. An animal that surely the mountain men would have enjoyed at the time. Many are familiar with the 1960’s novel Island of the Blue Dolphins by Scott O’Dell. For years children in Language Arts classes have read this book as part of the curriculum. The young main character of the book was actually based on the early 1800’s story of the “The Lone Woman of the Island of San Nicolas” who was believed to live for many years on her own in isolation. An interesting fact is that this famous novel has ties to a not-so-well-known but very important mountain man. George Nidever, known for being a brave man was immortalized in a poem by Ralph Waldo Emerson entitled “George Nidever”. Nidever was part of the small trapping party led by Alex Sinclair. Sinclair was one of the few men who were killed at the famous Battle of Pierre’s Hole. Nidever and his then leaderless party traveled to the 1833 Green River Valley Rendezvous right outside of Pinedale, Wyoming. George Nidever later joined Fremont’s forces and moved to California after the fur trade to continue hunting bears and otter. Every year the Museum receives interesting questions that our fur trade historian’s do the research and help answer for us. Here is some research by AMM member Scott Walker. Q: Did the mountain men use money or trade coins? A: A mountain man lived in a financial world where the American money economy met the Native barter system. Fur companies kept careful account of the dollar value of furs brought in vs. the dollar value of goods taken out, however the actual transaction at rendezvous or at a trading post was goods for furs, rather than cash for furs. 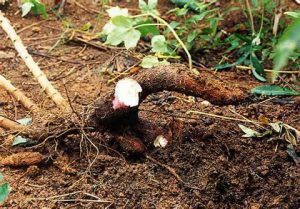 If a trapper had credit due him, it could be kept on the company books for future goods, or put in the form of a promissory note. 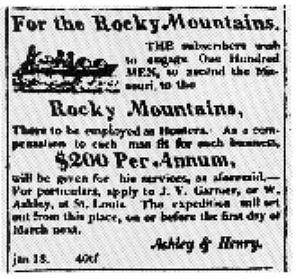 To receive hard currency for what was owed to him by a company, a mountaineer would have to make his claim at the company offices, typically in St. Louis. A trapper’s status with a fur company would determine how he traded with them. An engagee was a company employee who earned a set wage regardless of how many skins he brought in. In return he would receive his basic outfit and support from the company. In the mountains, any additional goods he purchased from the company were debited against his account. A skin trapper would borrow the cost of his outfit from a company and in return would agree to trade only with the company who outfitted him, at a set price per skin, until the value of his outfit was paid. A free trapper owned his own outfit outright and could trade his skins with whomever gave him the best price in goods or credit on the books. The companies were interested in keeping trappers working in the mountains, where they could be supplied needed goods at inflated “mountain” prices. In effect the rendezvous and the trading posts were the fur trade version of a miner’s company store. If a company could keep a mountaineer’s finances on their books, they could keep him trading with only them. Company clerks kept track of each trapper’s account and some of these records have survived. An individual trappers’ debits and credits can provide rich background to a mountain man’s story. Sometimes, during a particular trading session pieces of wood, quills or bone were used as counters to tally the number of skins traded. The counters were then used to purchase goods. Presumably, at the end of the trading session, any leftover credit or debt would be entered in the company books, as sticks would be easy to counterfeit. American companies didn’t use trade coins or tokens in the Rockies during the rendezvous years, however the North West Company, a British fur company, had a token minted in England. These 1820-dated beaver tokens are extremely rare today, with approximately 100 known, although modern pewter replicas are common. Finds of originals have been concentrated in the lower Columbia and Umpqua valleys, and it does not appear that these tokens figured in the American rendezvous trade. In the late 1850s, well after the rendezvous period, the Hudson’s Bay Company used minted metal tokens to replace locally-made wooden, bone and quill tokens in some of their Canadian trading areas. Their value was based on the worth of a beaver skin and rose and fell with the market. 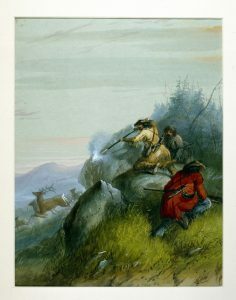 For further reading check out the archive of fur trade business documents at http://www.mtmen.org/, as well as Clay Landry’s article tracing the story of two promissory notes written in the mountains in 1830, appearing in Volume 7 of The Rocky Mountain Fur Trade Journal. An interesting view of the Museum from a drone flying above. Courtesy of Rocky Mountain Power. We got an email from one of our visitors who lives in Florida, she was intrigued by the hide dresses of the Indian women and asked if by any chance they washed them, and if, then how? True they were not very picky, but more importantly the beaver tail was considered a delicacy as the fat in the tail was very welcomed after a diet of lean wild meat. Apparently in Canada, beaver tails are a delicacy too. But in a different way. 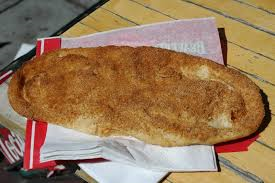 Beaver Tails, a Canadian based chain of pastry stands formed their pastry to resemble a beaver tail…Canadians must be Mountain Men enthusiasts as well eh? Did you know, that before Yellowstone was a National Park a group of Native Americans called the Shoshone or “Sheep Eaters” inhabited the area. Contrary to popular belief, this tribe was quite inventive, and intelligent. Instead of using horses to carry and pack in their belongings they used very large dogs. These dogs were quite loyal companions and very well behaved. Unlike other dogs that would hang around Indian camps, the Shoshone dogs would never get into food, or run away from their masters. The dog’s labor was essential to sheep eater survival so it was common that the dogs would be fed first at meal time. Another unique feature of this tribe is that their main weapon was the sheep horn bow. These bows were considered a thing of beauty as they were skillfully made with either sheep, elk or buffalo horn and decorated with porcupine quills and/or snake skin. A fine trade item they were well sought out. We have an original sheep horn bow on display at the museum. And the book featured below by Lawrence L. Loendorf and Nancy Medaris Stone is quite fascinating as each chapter goes into depth, the detail of these creative and caring people. Click Here to order this book! An Interview with Richard Ashburn. Mike Powell passed away June 3rd, 2015. The energy, dedication, and love he brought to the Museum of the Mountain Man and our community enhanced the lives of everyone he met. He will be missed more than words can say. For years a small 1826 journal was mistaken to be Robert Campbell’s diary. The journal was donated to the Campbell House Museum in St. Louis Missouri in an envelope marked “Campbell’s Diary” and it wasn’t until recently that an analysis of the handwriting revealed the the diary was not written by Campbell. The question remains…who’s diary was this? In comparing the writing in the journal to other fur trade documents there is considerable evidence that the owner was William H. Ashley. What a find! A tangible piece of history, an actual item containing thoughts of William H. Ashley, one of the famous co-owners of the Rocky Mountain Fur Trade Co.
Ashley’s diary contains numerous ledgers and drawings of rivers and topographical details. For more information and the full story on the discovery of this item check out Vol. 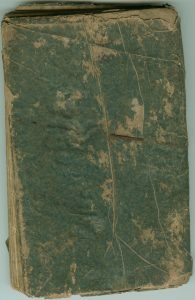 8 of the Rocky Mountain Fur Trade Journal which has a page by page transcript of the diary! Go back in time as you follow Ashley’s travels. 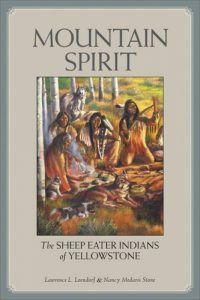 This little book is quite a discovery for the fur trade community, and leaves the question…what other valuable fur trade items are out there waiting to be found. Today’s Mountain Man Term is: Cache – A safe place, often hidden, for storage of food and other supplies. The mountain man, whether an explorer, a trader, or a trapper, cached goods for several reasons. The explorer could lighten his load for a difficult part of his journey, or cache important items (such as food, lead and gunpowder) for his return trip. The trader could store some of his trade goods for later retrieval. The trapper needed a place to hide his beaver pelts until he was ready to transport them to the markets back east. A successful cache had to be built in secrecy, in a safe location, and with the utmost care to avoid leaving even the smallest bit of evidence. We have a replica on display at the museum, with intriguing information on how it was built and what all they could contain. “The cache being completed, I walked to it and examined its construction. It is in a high plain about 40 yards distant from a steep bluff of the south branch on its northern side The situation a dry one, which is always necessary. A place being fixed on for a cache, a circle about 20 inches in diameter is first described, the turf or sod of this circle is carefully removed, being taken out as entire as possible in order that it may be replaced in the same situation when the cache is filled and secured. This circular hole is then sunk perpendicularly to the depth of one foot, if the ground be not firm, somewhat deeper. They then begin to work it out wider as they proceed downward, until they get it about six or seven feet deep, giving it nearly the shape of a kettle, or lower part of a large still. Its bottom is also somewhat sunk in the center. The dimensions of the cache are in proportion to the quantity of articles intended to be deposited. 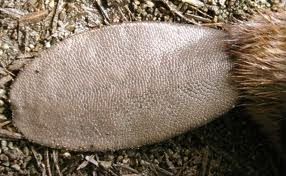 As the earth is dug, it is handed up in a vessel and carefully laid on a skin or cloth, and then carried to some place where it can be thrown in such manner as to conceal it, usually into some running stream where it is washed away and leaves no traces which might lead to the discovery of the cache. Rufus B. Sage was an American writer, journalist and later a mountain man. He is known as the author of Scenes in the Rocky Mountains published in 1846, depicting the life of fur trappers. Rufus B. Sage was born on March 17, 1817 to the family of Deacon Rufus Sage, in Cromwell, Connecticut, beforehand known as Middletown. He was the youngest of seven children. His father died when Rufus was 9 which left him in trouble of self-educating and raising. However, due to his vigor and determination Sage was able to self-tutor himself and start working as a printer in the Middleton newspaper. In fall of 1836 he ventured to Washington County, Ohio, where he became teacher and junior intern at the Marietta Gazette. Thereupon in the spring of 1838, he embarked on an enterprise which took him southward with a cargo of ice. It did not result in mundane earnings yet proved rich in observations; the events he observed in Louisiana and Mississippi made his mind upon the subject of slavery. After returning to civilization, in Circleville, Ohio he became well known as a writer, speaker and activist. He organised a debating club, which became very popular, and his press connections brought him in contact with the most prominent citizens of the country. In 1839 he ventured to Columbus, Ohio and thereupon he engaged in Ohio State Bulletin. In the early 1840 Sage became a part of political campaign obtaining to promote William Henry Harrison for president. A weekly campaign paper, and later on a daily, was edited and published by him, that did most effective service in bringing about the grand result of electing the whig national ticket by an overwhelming majority. Sage even exposed a democratic plot to smear his candidate. After the struggles of political campaign his attention was once again drawn to the unknown – so little was known about the territories between Missouri and the Pacific ocean. Incited by a strong desire to explore the vast region beyond the Missouri frontier, Sage organized a party to explore the west. Despite the fact that his party was scarce, Sage ventured onwards and later joined a party of Indian traders. This period was later described in his famous recollections entitled Scenes in the Rocky Mountains. In July, 1844, he returned to Columbus and commenced a campaign to support Henry Clay in becoming U.S. president, protesting against the annexation of Texas and the condition of Black slaves. His effort was grand but the election was won by James K. Polk. Later on Sage became editor of the Chillicothe Gazette, and worked there until 1845, when returned to visit his home town. In the quiet of his house he prepared his recollections for printing. But his future ideas of travel and adventure had to be changed – his elderly and invalid mother convinced Rufus to marry and settle down which he did and lived for the rest of his life in Cromwell. Rufus B. Sage died on December 23, 1893.